This Acoma pitcher was collected by Col. James Stevenson and his wife Mathilda Coxe Stevenson in 1884. Stevenson archives reveal that its accession number by the BAE (later incorporated into the Smithsonian) is 110354. The Smithsonian frequently traded or gifted pieces from their collection to supporters of the museum and it is likely that this is how this pot came to be in private hands. 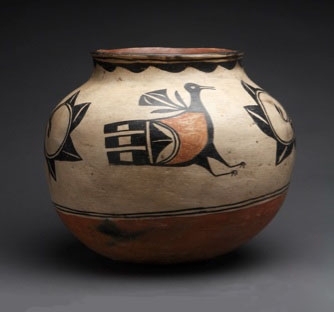 Three important 19th century Hopi pots have been added to my website (marcyburns.com).